Tracking your vehicles and their use can make managing your business much easier. Add to that accurate mapping that allows drivers to plan for what’s ahead on the road, and you have a powerful combination to help you manage hours and assets, and keep your fleet operating at its best. 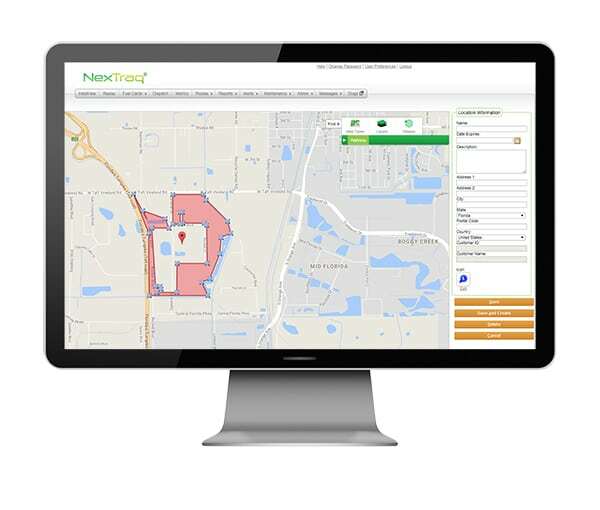 Powered by Google™ Maps, NexTraq’s geofencing technology allows you to create a virtual boundary around jobsites, vendors, customer locations—even areas you don’t want your vehicles to enter. When your vehicles enter or exit these geofenced areas, you’ll receive an alert.How can geofencing help your business? Arrival and departure times: Let’s say you want to know when your employees are on a jobsite. By drawing a geofence around the site, you can set up alerts to easily monitor when your employees arrive or leave from that location. Not only that, you can monitor for unauthorized vehicle use during working hours. Payroll and time management: For payroll purposes and billing accuracy, geofences are a game changer. Automatic alerts can be used to notify you when your vehicles arrive and depart from a jobsite. This creates a virtual time card, logging the time spent on the job. This can prove to be beneficial for employees who are paid by the hour or service workers who have charge-out rates. Asset protection: Problems with unauthorized use of company vehicles puts more than your asset at risk. A vehicle used after-hours or without permission can result in liability issues, increased insurance premiums, damaged property, and increased downtime. Triggered alerts can be used to notify you when a vehicle or piece of equipment moves outside of a geofenced area. This not only provides additional security, it offers peace of mind that your vehicles are safe. Stolen equipment: When a piece of equipment or a vehicle is moved outside of your geofence, you can receive an alert to notify you right when this action occurs. These alerts will only notify you so while the thieves may think they are getting away with your equipment, you know their location and can alert the police, saving you a great deal of money. Powered by Google™ Maps, NexTraq’s advanced mapping provides fleet managers with an outstanding overview of their fleet vehicles. Map types include roads, satellite, hybrid, and terrain to show elevations. Also available are a series of useful layers to help get a real-time understanding of what your drivers are encountering when on the road. 5 tips to help maximize fleet fuel consumption. Premier Generac® dealer and electrical services company increases fleet efficiency while improving customer relations. Industrial, commercial and residential HVAC company integrates fleet management solution with Compusource’s Ascente field service software to streamline operations. EMHC serves the Greater Memphis, TN area—a community of over one million people. See how NexTraq helps them provide compassionate, patient care. Interstate Aerials is a major aerial equipment rental company servicing the East Coast. See how NexTraq helps them grow by staying ahead of the curve.